Once more we have returned, Beasts of War, to the hellfire and chaos that was the Battle of Kursk, considered by most military historians to be the largest single engagement in the sweep of human history. 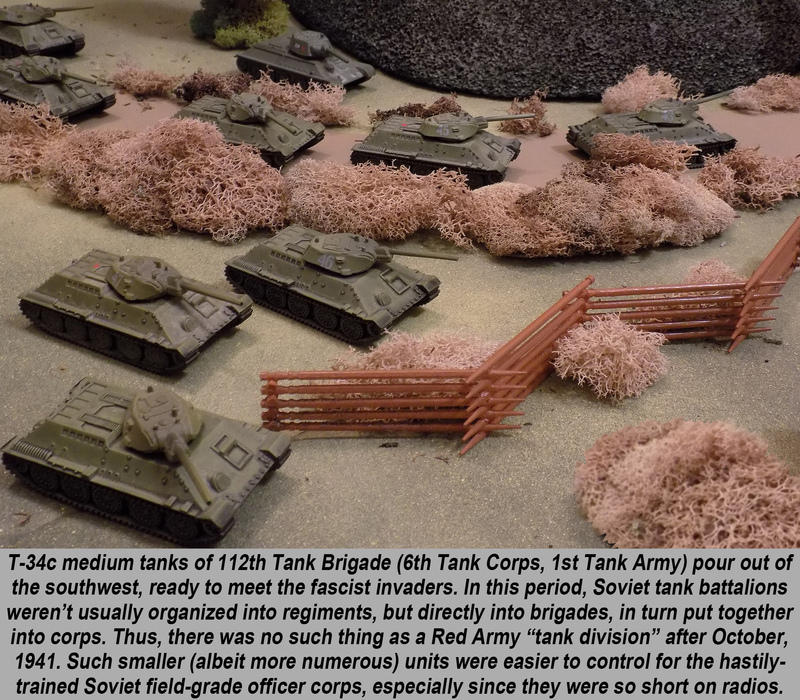 This month marks the 75th Anniversary of the Battle of Kursk, so we’ve been taking a wargamer’s look at this earth-shaking event. If you’re just joining us, here’s a very fast recap of what we’ve covered in Parts One and Two. In the wake of their shattering defeat at Stalingrad, German armies fighting in Russia face grim prospects for summer, 1943. They have to win a major victory somewhere, to redress the disintegrating situation on the Eastern Front, restore morale, and show the world that the outcome of World War II has not in fact already been decided. They select a massive westward “salient,” or bulge, in the Soviet battle line, centred on the Russian town of Kursk. About the size of Northern Ireland, if this salient can be sliced off by converging flank attacks from north and south, several Soviet armies will be lost and the Germans maybe…just maybe…will have bought some time. To launch this do-or-die attack (Operation Citadel), the Germans spend months massing together absolutely every ounce of firepower they can muster, suspending major operations virtually everywhere else in the war. New tanks are rushed into production, new divisions raised, old divisions are carefully rebuilt and reinforced. The problem is, the Soviets see this attack coming and do the same. Their plan is to set up the deepest defensive belts in the history of warfare, let the Germans hit them and wear themselves out, then cut loose with a devastating armoured counterstrike. The end result would be a battle simply unmatched in the history of humanity. In Part Two, we saw the Germans launch the northern wing of their all-or-nothing attack. Now it’s time to switch to the southern shoulder of the Kursk Salient for the other wing of the German strike. As gargantuan as the battle was in the north, unbelievably, the German attack in the south was almost twice as big, as we’ll see below. The southern German wing of Operation Citadel was mounted by Army Group South, commanded by Field-Marshal Erich von Manstein. He had two major formations at his disposal, Fourth Panzer Army under Colonel-General Hermann Hoth, and “Army Detachment Kempf” under General Werner Kempf. Facing the Germans was the Voronezh Front (roughly analogous to an army group) under General Nikolai Vatutin. A greatly overlooked and underappreciated commander, Vatutin and been fighting (and winning) battles against Manstein as far back as September 1941. Never had they faced off in an engagement like this, however. Preliminary assaults were undertaken on July 4th, 1943, with the first main attack unleashed in the predawn hours of July 5th. So accurate was Soviet intelligence, however, that they were able to drop a devastating pre-emptive artillery barrage just minutes before the German artillery opened fire. The omen was an ill one, to say the least. For our games set in the southern part the Battle of Kursk, I’m focusing on two of my all-time favourite units, Panzergrenadier Division Grossdeutschland for the Germans (hereafter “GD Division” because that’s just way too much typing to do over and over) and 1st Tank Army (later 1st Guards Tank Army) for the Soviets. 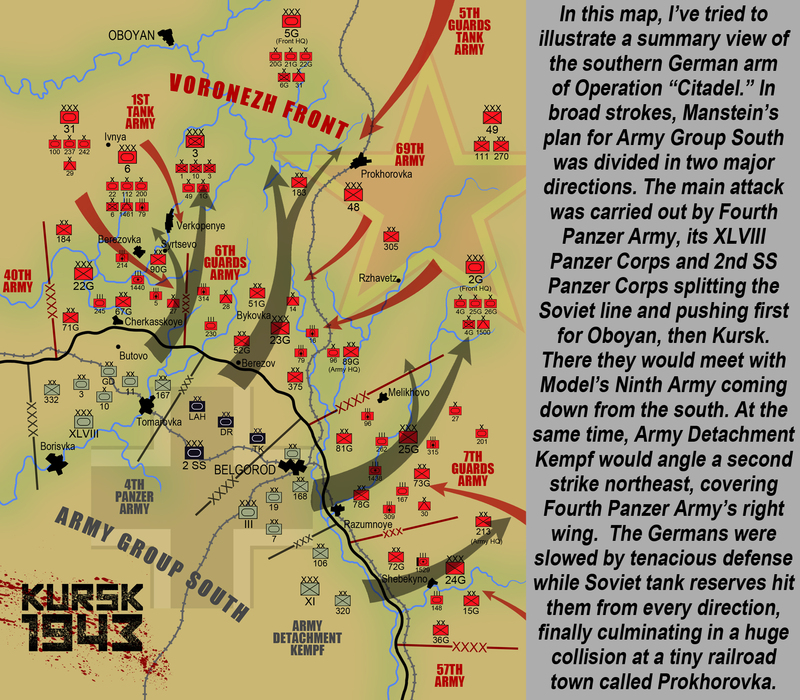 Forming the centre of the XLVIII Panzer Corps, GD Division helped smash through the initial line of Soviet resistance at Cherkasskoye when the Battle of Kursk opened on 5 July. Here is where the new PzKpfw V “Panther” tank made its ignominious debut, huge numbers breaking down or catching fire without even being hit. Despite these problems, GD Division had cracked and pushed through the main line of 6th Guards Army. By 7 July, however, a new threat was posed on the corps’ left wing by mobilizing reserves of General Katukov’s 1st Tank Army. Thus, GD Division was compelled to shift its spearheads to the west and meet masses of Soviet armour. This sparked a series of battles amidst villages, hills, and forests along the Pena River, which I’ve been recreating through “command tactical-level” games of Avalon Hill’s PanzerBlitz. Even though PanzerBlitz is designed to handle this higher command level, the sheer scale of these battles strains even the PanzerBlitz system. For these battles, we have the shattered remains of the Soviet 3rd Mechanized Corps, desperately holding against yet another assault of GD Division while powerful armoured reserves of 6th Tank Corps (1st Tank Army) rush to help. The Germans thus have to cross a river and take fortified high ground before Soviet counterattacks arrive in force. 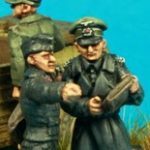 The GD Division is, in my opinion, the perfect historical German division for wargaming. They were elite and lavishly over-equipped with the best equipment and tanks like the Waffen SS divisions, so you get to play with the best toys. Yet they remained relatively free of the political stigma and war crimes in which SS divisions are drenched. They were also drawn from all over Germany (hence the name “Greater Germany”) and so don’t suffer from the provincialism that you see in many regionally-raised German units of the period. At Kursk their panzer regiment was led by Colonel Hyazinth von Strachwitz, a bonafide “graf” (count) and one of the true top panzer aces of the war. The 1st Tank Army, meanwhile (everything here is part of 1st Tank Army), is commanded by my favourite Soviet general, Mikhail Efimovich Katukov. In the thick of the war from the moment Germany invaded (breaking out of a hospital to re-join his division), he would later be given command of the Red Army’s very first Guards Tank Brigade. He would write the book on new Soviet tank tactics, and would wind up commanding the Red Army’s premiere 1st Guards Tank Army, spearheading the assault into Berlin and commanding Group of Soviet Forces in Germany after the war. At Kursk his army took horrible losses, mismanaged and committed piecemeal by higher command. Now it’s time to zoom in and chuck some dice in 15mm Battlegroup: Kursk. 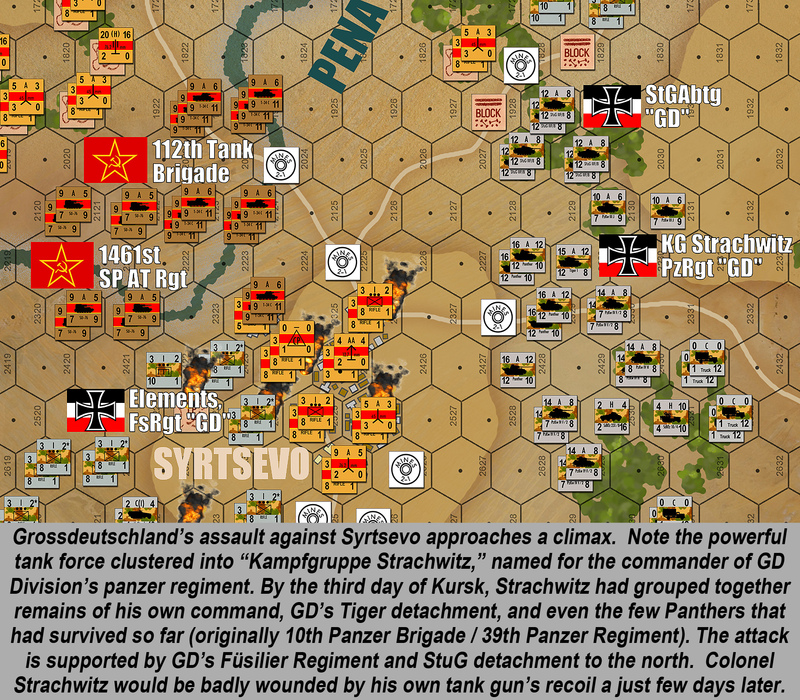 Again, these games take a “sample” of the larger historical engagement - part of Panzergrenadier Division Grossdeutschland’s assault on Soviet positions near Syrtsevo, and dealing with counterattacking spearheads of 1st Tank Army. I keep trying to keep the size of these lists to a manageable level, but it’s almost impossible to do anything “small” in the Battle of Kursk. Again we’re pushing 800 points, including the massive amount of artillery, air, and engineering support both sides bring to the table. The Germans have a small representation of Kampfgruppe Strachwitz, built initially on the “Panzer Count’s” own GD Panzer Regiment, but now also including the remains of Panzer Regiment 39 (Panthers) and even a few of the division’s Tigers (yes, Grossdeutschland was one of those lucky divisions that usually had its own Tiger detachment). Not wanting to make the same mistake as in Part Two, I make sure to take detachments of German engineers this time. Historically, the remains of those Panthers basically died in more Soviet minefields at Syrtsevo, I’m hoping to rewrite a little history here. Speaking of which, the Soviets are also applying lessons from past games. This time they’re bringing a 37mm AA position, which should help the T-34c tanks of the 112th Tank Brigade and SU-76 assault guns of the 1,461st SP Artillery Regiment get up to the line without being gored by Stuka airstrikes (as they were historically). The battle gets started. 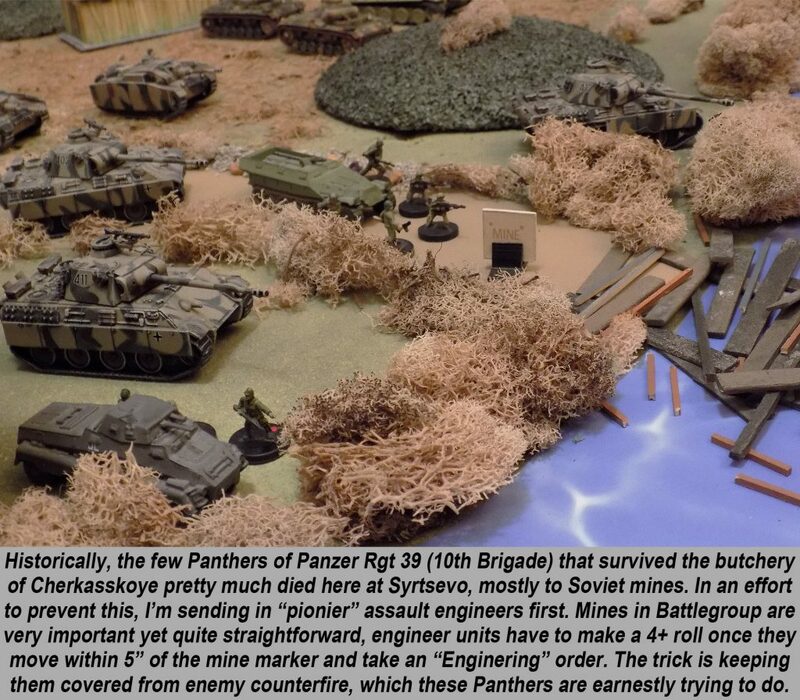 Panthers and halftracks roll up to just short of the central Soviet minefields, putting down a curtain of cover fire as assault engineers jump out of the halftracks and immediate score on their 4+ roll to clear the mines. The Germans have to hurry here, they want to cross the Pena River before the 112th Tank Brigade arrives. Things go pretty well for the Germans on their left (south) wing. Braced by the PzKpfw VI “Tiger” tank, and with the way across the demolished bridge cleared by the engineers, the Panthers and PzKpfw IIIs are able to ford the river just as the T-34s of the 112th Brigade arrive. There’s an immediate shootout, which the Germans win rather handily. One problem the Germans admittedly have is the “Unreliable” special rule for the Panthers. 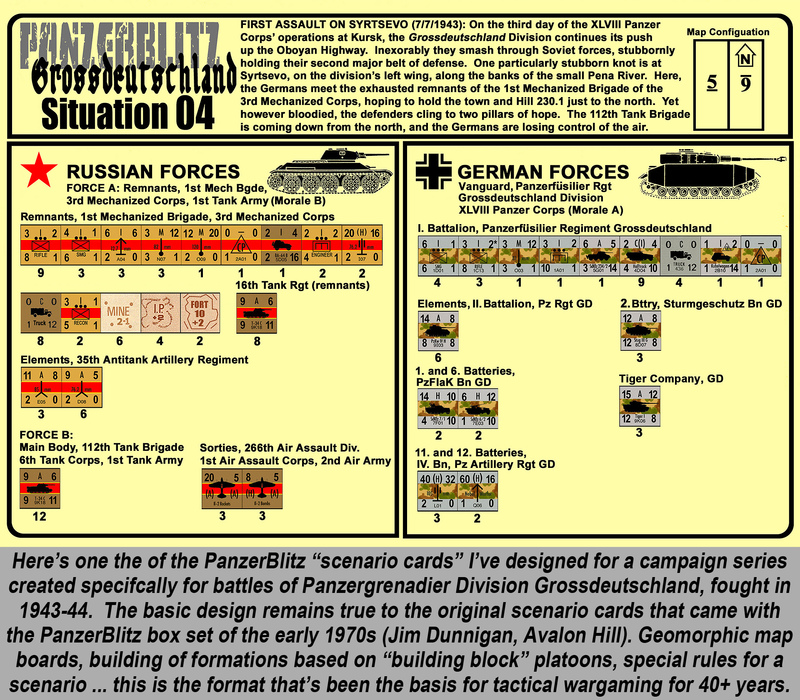 In summary, if the Soviet player draws a battle rating counter with a value of “1”, instead of taking a 1-point hit to his force’s battle rating, he can instead play it as a “Break Down” counter on a Panther and force it to roll on the Break-Down table. Depending on the result of this roll, the Panther can either shrug off the breakdown, become immobilized, or possibly catch fire and force the crew to abandon the tank (brewing up, in game terms). You’re always going to lose at least one Panther this way – at least at Kursk. Later in the war, of course, these problems were corrected. 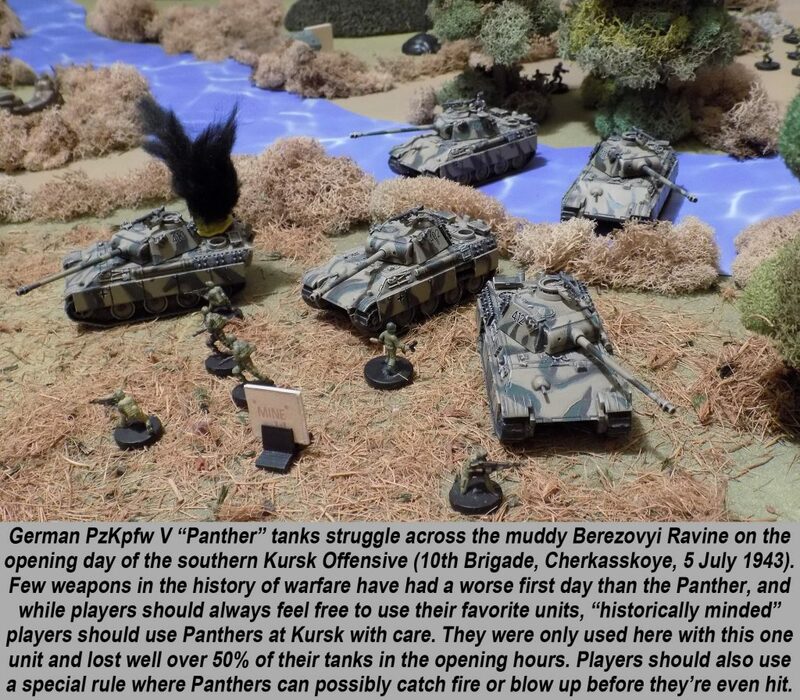 The Panther’s antitank hitting power, however, makes it worth the headache on the gaming table. It’s 7.5 cm gun hits even harder than the Tiger’s 8.8, a historical detail Battlegroup nails with typical accuracy. This is because of the longer 7.5cm fire with much higher muzzle velocity, which is the key factor in punching holes in the enemy armour. On the German right wing, however, things don’t go so well. The platoon of PzKpfw IVHs fords the river easily enough but is positively speared on Soviet antitank fire from Syrtsevo and the high ground just beyond. Tanks that are pinned instead of killed are then close-assaulted by Soviet infantry, then hit by counterattacking T-34s. 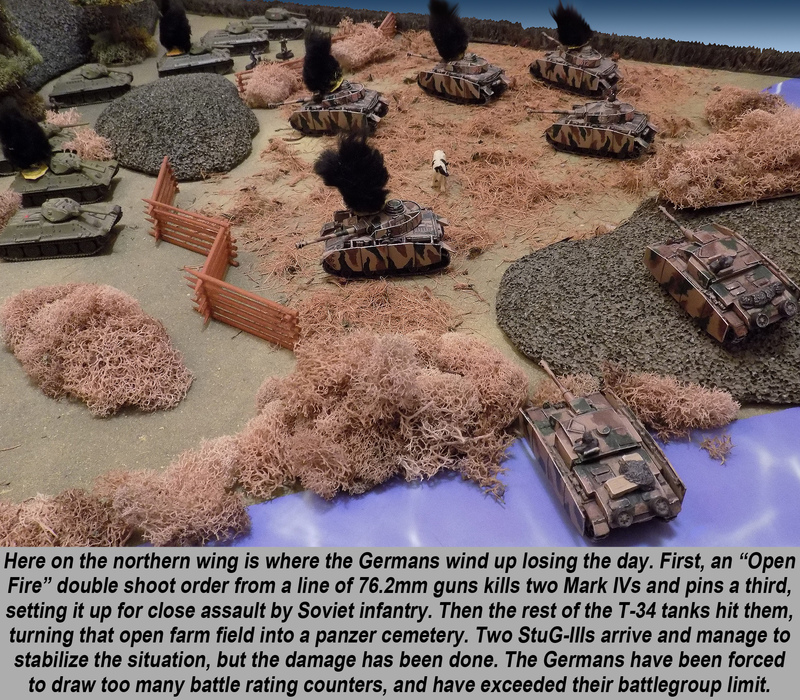 In the end, only the two StuG-IIIGs of the StPzAbtg “Grossdeutschland” are left to redress the situation. They do pretty well, but far too many Mark IVs are burning and the Germans don’t draw any good battle rating counters when losing these units. All too soon the Soviets of 1st Tank Army win this game, 48 to 42. I hope you’re enjoying this continuing exploration into wargaming the Battle of Kursk. Please return next week when this battle at least reaches its climax, the titanic armoured clash at Prokhorovka. While a lot of myth has been wrapped around this battle, it still remains by far the largest single tank engagement … that has ever happened. In the meantime, please leave your comments, questions, and any feedback you might have. 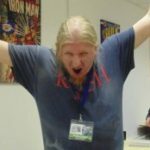 Do you have “favourite units” you like to play in historical wargaming? I know some of you do, I even know what some of them are! 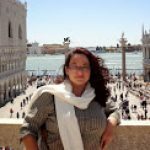 Keep the conversation going as this “mother of all battles” rages on! 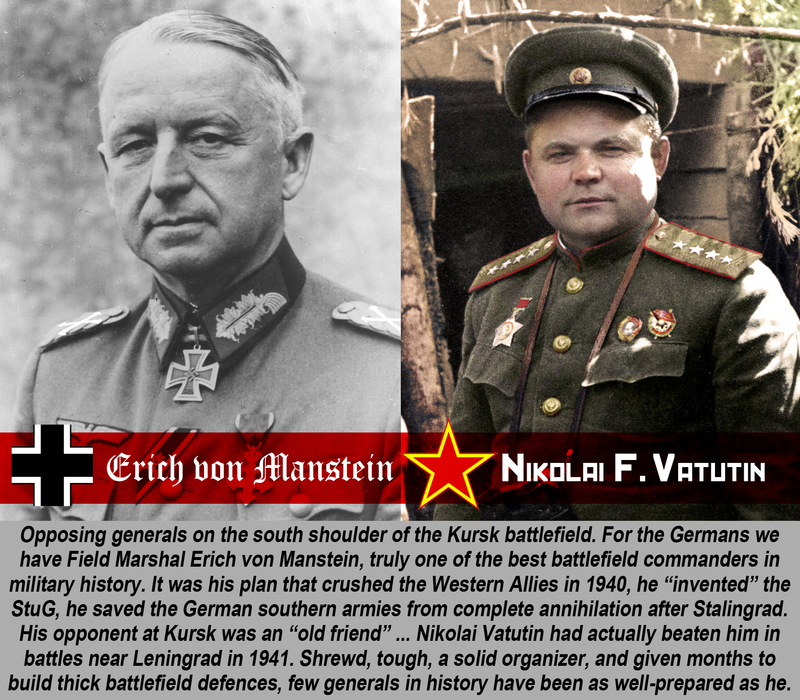 "A greatly overlooked and underappreciated commander, Vatutin and been fighting (and winning) battles against Manstein as far back as September 1941..."
"I keep trying to keep the size of these lists to a manageable level, but it’s almost impossible to do anything “small” in the Battle of Kursk..."
To me, Kursk represents the same as the battle of Britain, the Germans take losses that give away their advantage for no gain ( if the Battle of Britain knocked England out of the war, then it could have been worth losing all of the planes and pilots ( and more ) but in the end, you lost planes and pilots and the situation remained the same ( if not worse since you now are minus all the planes and pilots ). I see this in alot of games, for the germans to win, they have to ensure that what they lose actually causes the allies distress. This is very true, @tacticalgenius – I would perhaps add that the Germans really didn’t have any “advantage” at Kursk, but any kind of parity they may have had they certainly lost for no gain. In fact they only opened the door for the Soviet counterattack, as we’ll see in Part 05. Yes, that would be one interpretation, giving away their advantage ( especially in Mobile warfare which they excelled at ) but also having a large mobile force ( that could be reserve, used to contain soviet breakthrough’s , etc ). Totally agree about the obvious nature of the Kursk Salient as a target. We touched on this is Part 01 with the section header: “A perfect target – TOO perfect.” And also in the Live Stream interview – even if the Soviets didn’t have triple-authentication from three different intelligence sources, the place of the Kursk attack (Operation Citadel) would be blatantly obvious. Probably the biggest impact the Germans could have had here is to let the Soviets hit them first, them pivot with flanking counterattacks in a bigger version of “Manstein’s Miracle” or “Manstein’s Backhand blow” as we saw in Feb-Mar 1943. But who knows? Just my idea. I think I see what you’re saying, @zorg . If the Germans won the Battle of Britain, they could reclaim many of their lost pilots from British POW camps? I actually don’t think that’s true, as most British POW camps tended to be located in places like Canada to minimize escape risk. Very true @oriskany but that was later in the war after the Things have settled with Germany going for Russia I think will nead to do some digging to confirm what’s what. Cool deal. I know SOME German officers were kept in England (the famous castle where German officers were secretly tape recorded) – but the vast bulk of POWs were shipped overseas. Many Italians were imprisoned in Scotland and many stayed after the war that’s why we had so many good cafe’s around and ice cream’s. Yep, huge German populations in western Canada and especially North Dakota and South Dakota in the US. Actually went to high school with one of their grandsons, the grandfather fought at Moscow, was wounded and evacuated, and was later captured as part of the big Tunisia surrender in May 1943.
this has the camps that held the prisoners. Great article, brilliantly written as always. Good to see the Panthers enter the war, albeit in somewhat self combustible manner. I do love the Panther (although probably not at Kursk). I’ve also found taking dedicated AA in some of these company sized games to be highly effective. As you say, it’s good a keeping enemy aircraft at bay and arguably more useful at dealing with enemy infantry. I tend to include it in lists now when I can. The trick (at least for me) is to find / take some kind of AA weapon that can also be used against ground targets. Soviet 12.7mm (50 cal) AA, 37mm AA, and German 20mm FlaK AA autocannon come to mind. This way, if enemy aircraft never show up, or if you take your one shot at them and miss, the points aren’t wasted. These 20mm and 37mm autocannons can do amazing work in Battlegroup and PanzerBlitz (never tried them in FoW yet) against soft targets like infantry, artillery, etc, or even light armor in many cases. My personal choice, when playing Germans, is the Wirbelwind although as this wasn’t introduced until 1944, it wouldn’t have been trundling around the fields of Kursk. I prefer my dedicated AA to be mobile – it makes up for my usually poor deployment and lack of tactical thinking! 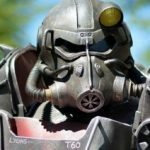 I know what you mean re: the Wilbelwind. My “example” for Wirbelwinds in wargaming comes when they were introduced to Panzer Leader for t he 1944-45 campaigns in the west. This is also when the designers brought in Allied fighter-bombers like Typhoons and Thunderbolts. So EVERY Panzer Leader scenario included at least a couple of these … despite the fact that the Germans only had 100 of these built at most and as you say, were only introduced late in the war. Fortunately, there are other solutions to bring in armored (sort of), mobile air defense for historical German OOBs. Point is, there are options for mobile German AA defense, they just won’t be as well armored as the Wirbelwind (based on a PzKpfw IV chassis). I would argue (and many…many others would too) That the German armaments industry was pushing too hard for Panther to be ready. Like what we said during the Livestream, so many of them broke down as to nearly make their deployment an utter failure. But, as with all the BIG CATS, once they got into combat they proved themselves in firepower and armour. Vehicle for Breakthough operations. It must have armour heavy enough to withstand currently known AT weapons (in 1936-37 this was between 37mm and 47mm) And must have firepower enough to deal with enemy armoured vehicles and fixed defences. THEN and only then was the unit with its shiny new vehicle deployed as an active unit. What happened on the runup to Kursk was something a little different. Prototypes were rushed through trials and production commenced. I would 100% agree that the Panther was pushed too hard to be ready. Additional armor and other weight-increasing factors that were added to the design later in the process resulted in the overall vehicle becoming too heavy for its suspension, engine, and transmission, while not enough time was left to go back and redress these new power/weight requirements. In addition to being rushed too fast from a mechanical, technological, or industrial perspective, getting the Panther online for Citadel caused military and operational delays for the start of the offensive. Operation “Citadel” was originally scheduled for mid-May, when it would’ve had a much better chance of success because those incredible Soviet defenses weren’t yet in place. But as Citadel was postponed over and again to get Panther and other new systems in place, the Soviets had all this time to prepare. The end result is the Germans left with the worst of both worlds … criminally-postponed offensive now with no real chance of success thanks to Soviet defenses and reserves … and the tanks / tank destroyers / SPGs that caused these delays are nowhere near ready. I would also agree that the Panther’s development and initial deployment was very atypical to the usual method, in all the worst ways. Existing units like Panzer Regiment Grossdeutschland were not pulled out of the line, given new equipment in German, Poland, or France, and allowed to train on it. Instead, GD was left on the line while a new unit of raw recruits was given the Panthers and then sent to join GD instead. The result, as we discussed in the live stream, was disaster. Again, I think this was a symptom of the rushed timetable – it’s faster to send the tanks to the division in the field, rather than pull out of the division out, ship it back to a training base, train for 6-8 weeks, then load it back on the trains and send everything back to the front. As you say, this is definitely the usual way things were done. In fact, in April 1944 part of GD division was pulled out to France to take / train with new equipment, and were in northern France when Overlord hit. These officers and men were quickly folded into 21st Panzer for some of the later Normandy battles (particularly around Caen, like Epsom, Bluecoat, etc. 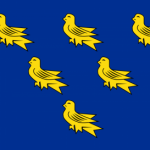 ), making them the only GD men to fight in the West to my knowledge since Case Yellow in 1940. And yeah, as far as Dr. Porsche goes . . . wow. What else is there to say? Didn’t his initial proposed Tiger Design have some kind of strange turbo-electric drive or some such? So confident was he that his design would be accepted that he started building vehicles before the contract was actually awarded. Once Herschell’s design as selected over his, he was left with all these half-built Tigers. These later be purchased anyway and used to construct the “Ferdinand Elefants” we see in JgPzAbtg 653 / 654 with Ninth Army on the north Kursk Shoulder (Part 02). Certainly possible. One might also argue the case that a German victory might have saved lives AFTER the war, or at least made things better for certain countries in Europe. So if a truly grisly German “victory” is won at Kursk, the Soviets are stalled for an extra summer. They’ll still win big in the winter of 43-44, but now they’re six months behind in their timetable for the liberation of the rest of Russia, Belarus, and Ukraine, then an invasion of Eastern Europe. Would this have meant the Anglo-American-French armies push deeper into Europe? A united pro-West Germany immediately after the war? No Berlin Wall, etc? Honestly I think the idea that Berlin would be left to the Soviets came at the Tehran Conference, i.e., this was a political decision rather than a military one. However, Tehran Conference wasn’t until November ’43, AFTER Kursk. So if Kursk was a Soviet disaster, would that Berlin concession have been made? Perhaps not. Im not sure whats meant by the Heer not being involved in the Panthers development. A special commission of the Heereswaffenamt and several tank manufacturers went to the Soviet Union to inspect captured T34s in respobse to combat commanders request for a German copy. German industry couldn’t produce a copy of the T34 so their answer was to look at a new design. The Heereswaffenamt awarded the VK3002 design contract to MAN and Daimler-Benz. It was the Heereswaffenamt who chose the MAN design, indeed over Hitler who preferred the Daimler design. The component tests began in late 42 and the first demonstration was in November using the first two prototypes. Even in early production the gear problems with the drive were evident. The first production vehicle was delivered in Jan 43 and vehicles were issued for training and service test in Feb 43. It was the high production quotas that outstripped machining capability that led to the new gear train that was always its issue throughout its use. A further issue was that all would be Panther manufacturers also built Panzer IIIs and the Heereswaffenamt insisted production not be reduced. This added a extra strain on proceedings. So the Heereswaffenamt were involved in the Panthers creation. The crews of the two Panther battalions did receive training, the main issue was that it didnt extend beyond platoon tactical actions, this resulted in units failing to take sufficient care of flank protection, and one also has to question the leadership and communications of the Panther units. Engine fire was a hazard for Panthers at Kursk and this was further aggrevated by defective seals and gaskets. The engine was also prone to over heating due to its inefficient cooling system. But despite all this, the Panther still seems to have accounted for almost half of the enemy tanks knocked out by XXXXVIII Panzer Corps. This despite have an average service rate per day of only one quarter their vehicle strength (and dropping as low as only 16 operational vehicles on 9th July) and constituting only one-fifth of the of the operational tanks in the corps. So despite it all, it was excelling as a tank kilker. Army’s involvement with Panther development – I’m actually going to stay out of that one as I don’t know very much on that aspect, outside of Guderian’s involvement as General-Inspector of Panzer Troops and the role Panther’s development and deployment played in the Citadel timeline, and even here my knowledge is pretty generalized. I know a little of the technological and mechanical detail, not nothing really to add to what’s already been said. Robert Forczyk writes they “conducted no unit training **, more than one-third had no combat experience, and the regiment was sent by rail to the front without a commander.” Apparently Major Lauchert was their training officer (this I did not know until recently). **No unit training, I assume this is what we’re talking about by not extending beyond platoon actions as you mention, no flank protection, etc. First off, 10th Panzer Brigade’s 200 starting Panthers account for about 42% of XLVIII Panzer Corps’ starting strength (3rd Pz Div: 59 Pz IIIs, 23 Pz IVs – 11th Pz Div: 62 Pz IIIs, 26 Pz IVs – “GD” PzGrDiv: 23 Pz IIIs, 68 Pz IVs, 12 Tiger Is … I’m not counting Pz IIs or BePz Is, or assault guns). That’s 261 panzers total among the three component divisions NOT including those two Panther battalions (200 tanks out of 473 = 42%). So honestly, the Panther makes up almost half XLVIII Pz Corps starting tank strength … so almost half the tank kills make sense. Granted, this is over simplified … it neglects the assault guns and neglects the early losses to PzRgt 39 due to combat and mechanical breakdown (resulting in a small percentage of tank strength racking up larger percentages of kills). But whatever may have been wrong with Panthers’ drive train, engine, suspension, transmission, or exhaust, there was nothing wrong with that friggin’ 7.5 cm gun. Adding to this was the criminally piecemeal way that Katukov was forced by his superiors to commit units of his 1st Tank Army – his commanders at Front and STAVKA level still hoping to save as many big tank assets as possible for their expected counterattack. As I’m sure you know, one of the few things Soviet intelligence got wrong at Kursk was the balance of the two German attacks, they expected Model’s Ninth Army to hit harder in the north than Hoth’s 4th Panzer Army / AD Kempf in the south. As a result, Rokossovsky was even better prepared than Vatutin. This results in XLVIII Pz Corps / II SS Panzer Corps making much better ground and soon threatening local breakthroughs, forcing Vatutin to order Katukov to commit elements of 1st Tank Army, but only in spoonfuls at a time. I bring this up because one we get past Cherkasskoye, XLVIII Panzer Corps in the left is fending off a lot of counterattacks, most of them armored. So you have T-34/76s, T-70s, and SU-76s coming to the Germans (ironically) instead of vice versa. If the Panther can hunker down on good defensive ground (notably their remnants in the Verkopenye-Syrtsevo-Berezovka triangle) they can shoot the hell out of these advancing, under-powered Soviet armored counterattacks and rack up great kill rates out of proportion to their remaining numbers. And finally, I’m not 100% certain of the details here, but after Cherkasskoye the remants to 10 Pz Brigade / 39 Pz Rgt seem to have been folded (at least partially) into “Gruppe Strachwitz.” Now under unified command, with more solid veterans on their shoulders, the handfuls of remaining Panthers seem to have done a little better, although again I don’t think many of them got past Syrtsevo (16 runners on July 9, as you say). Glad you like the series so far! As with all aspects of the Third Reich, bureaucracy and personalities got in the way of things… It was never a good environment… The Panther was rather a problem child at times. Yes.. the training was way below standard for crews new to a vehicle, and especially one with such vagaries. The Tiger I, but especially the Panther, required a driver with a fine touch. It wasn’t a vehicle that reacted well to rough handling by drivers, and this was not something that could be rushed. While they may have made up a large proportion of the theoretical strength, the individual daily returns for Operational panthers is far less. They rarely exceed 40 – 50 operational vehicles on daily counts, with a low of just 16 on 9th July. However just a note of caution in the daily returns… these were often counted in the evening (though two counts were down most days at 1900 and 2400 hours to ascertain any repairs) so overnight the workshop crews could put more back into service by the following morning and this they did with amazing speed, so by the following morning the available operational numbers would likely increase a small amount. So in terms of operational tanks actually available, they perform reasonably well considering. If you don’t have it, I would recommend Zetterling’s ‘Kursk – A Statistical Analysis’ as it delves very deep into the vehicle loss rate and operational availability in some detail, as well as providing some interesting statistics with regards the battle overall. Its a analysis worth having to dip into alongside more traditional battle narratives such as those by Valeriy Zamulin. Look forward to the next part! Absolutely. We tried to touch on this a little in the live stream, where Panther drivers ran into that muddy ravine, minefield, and interlocking antitank gun fire, and the drivers (many of them green) started to panic and jam the gas as hard as they could. The Panther’s components just couldn’t take it. Again, totally agree. Hence I put the bold on starting strength in my first post. Although PzRgt 39 started with 204 assigned Panthers (that is just a HUGE regiment, by the way, at least my post-1940 German OOBs), I’m certainly not saying they were anywhere near that strength after (or even during) Cherkasskoye. Not if the handfuls of survivors or being folded into “Kampfgruppe Strachwitz” along with other remaining tanks of Panzer Regiment Grossdeutschland. I’ll definitely check out that Zetterling reference. Glantz is the one I’ve been leaning on most heavily, along with the usual suspects from Osprey and Stackpole Publishing. Did find a small error in Forczyk’s Kursk series for Osprey (misplaced / misidentified SPzAbtg 503) but I think that’s more of a typo on the part of their graphic designer than actual research. @oriskany do check Zetterling his statistical work is excellent. Zamulin has three books on Kursk and as the former Kursk museum curator he has a very interesting perspective. Nipe’s book is also a great one to get too. Zetterling definitely sounds interesting as this is the kind of fact-based, empirical data I find most useful, too many TV documentaries rely on anecdotal stories, etc. And Zamulin as well, always on the look out for more of a Soviet perspective, one of the reasons I’m such a fan of Glantz. 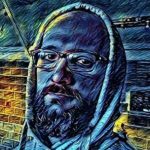 I was going through some German after action interviews last night and happened over some from Kursk that I had forgotten about since we did the research on BGK. What was interesting was that the German panzer crews had little fear or issue with enemy armoured vehicles. What comes across is a deep fear of camouflaged enemy AT guns that would wait and engage from the flank. I think this is a common issue for many tank crews but bears repeating. They also commented on the lack of infantry support at times. An interesting snippet came from the Tiger crews at Kursk who commented on the difficulty of dealing with hidden AT Rifle teams in fox holes that were virtually invisible to the crews and who would target vision blocks and optics. Several Tigers were put out of action, and several crew injured or killed, by simple two man AT rifle teams. Although the tank was easily repaired, it was inoperable for sometime and the effect on crews of head injuries and eye injuries from optic/vision block damage had a morale effect out of all proportion to the enemy resources. It just goes to show that even the behemoths could be vulnerable. That’s a very good point, @piers – with the Soviet armor of this time period still being T-34/c, SU-76, and even lots of T-70 light tanks (as we’d see at Prokhorovka), Mark IVs F/G/early Hs, would have no issue with those kinds of opponents. The Soviet 76.2mm ATG that @johnlyons was bringing up in the live stream, along with the new 85s coming out, are another matter entirely. I’ve read that Wittmann is also on record (I know, not everyone’s favorite) as saying he prized ATG kills even more than enemy tank kills because he always saw ATGs as a much greater threat. After all, Schurzen were adopted purely to counter Anti-Tank Rifles. With heavy tanks the defence density was high too… at Kursk multiple teams would engage the heavier tanks. Otto Carius had a near miss with a Soviet antitank rifle. He said a glancing blow from a AT Rifle round on his cupola’s Kinon vision block blinded it and knocked off a chunk that ricocheted inside the turret. He reckoned a flat angle hit would have gone straight through the block… and him. Couldn’t agree more, @piers – we hit this during the live stream when someone mentioned PTRDs in the chat so we brought it up. The idea that in some of the better-equipped regiments and rifle divisions, every platoon had at least one of these. They don’t appear as separate units in PanzerBlitz because every piece is a platoon in that game, and they assume every platoon has at least one (enhancing its longer-ranged AP value in some scenarios). Honestly I’d have more of them on thee Battlegroup tables, I just don’t have the minis for them. In the past I have proxied prone Soviet snipers as AT riflemen – but that’s something I didn’t want to try to get away with in the photographs for a front-page published article. 😀 Some of the Stalingrad games we ran for the 75th last year and even Barbarossa games in 2016 (again, the 75th) had them as well, just not on the “front page” I don’t think. Another pinnacle of awesomeness from obhe, great as great can be. I do not have a favourite unit, but I have a favourite commander/general, which happens to be Erich von Manstein. I already knew about him taking command for operation Citadel, but he was also in charge of taking Sewastopol. This is, in my humble opinion, also a battle that is worth to spend some time with. Huge guns (railway guns), fortified positions, many Russian bunkers with martially sounding names, indomitable defenders fighting to the last man and and and. And, as concerns Manstein, he even had a military career after the war. He was some kind of advisor to the Federal Government, when the Bundeswehr was planned and built up. During the war he made it to the front cover of time magazine, and he was called “The Most Dangerous Military Adversary” or something along these lines. Quite strange to learn that from March 1944 on he had to “resign” to the “Führerreserve”, that means no military command anymore. This was because the fly-moutached one did not want to have someone contradicting him on strategic matters. As for Panthers and gaming with it around Prokhorovka, Bolt Action has a theatre selector for the battle with a special rule for the Panther. It´s a quite apprpriate rule and the Panther quite happily and readily and easily breaks down, catches fire or whatnot. Thank you for the fabulous part of the Kursk series. Za rodinu! Very true, @rasmus – Hitler certainly stole credit for Manstein’s “Sickle Cut” plan for the invasion of France and the Low Countries – Case Yellow, May 1940. Thanks very much, @jemmy ! Yeah, I’d have to totally agree with you on the selection of Manstein. He isn’t invincible, in our Barbarossa series we talked about one instance in September 1941 with Army Group North he let some of his divisions get a little too isolated from one another (forward battlegroup of 8th Panzer, I believe) and Vatutin cut him off and almost destroyed it. Some would say he also took way too long to clear Sevastapol, and of course he also failed to reach Sixth Army in Winter Storm. I don’t think that was ever really the aim of Winter Storm, however, everyone knew it was an impossible mission. The idea was to get halfway to Paulus and give him a way to break out. But of course Paulus determined to obey the Bohemian corporal. Manstein’s most brilliant moment I still feel is the “Backhand Blow” of Feb-March 1943. Absolute art, while under the most ridiculously difficult conditions. Yeah, the final end of his career, at least during the war, was after the Cherkassy-Korsun Pocket battle, February 1944 (the famous “Tigers in the Snow” along the Dniepr Bend). Basically, the Germans were facing a mini-Stalingrad, at the hands of another Soviet double-envelopment, and Manstein gave the order to break out against Hitler’s orders. Fatefully, his “rival” Vatutin was also meeting the end of his career at about the same time, killed by Ukrainian separatists in February 1944. Battlegroup is a little more forgiving. In Kursk they have the “unreliable” special rule, which means whenever the Soviet player has to draw a Battle Rating Counter and gets a “1” – he can instead play it as a “breakdown” counter on a Panther, causing it to stall in place for the rest of the game or perhaps even catch fire so the crew abandons (unit destroyed). a great read @oriskany did the first panthers not have smaller engines that may have been the problem with the fires? 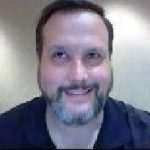 @zorg – I would defer to guys like @johnlyons and @piers for the technical and mechanical details. But the high level is this: The Panther was designed in a hurry, but its weight was tested for its engine, suspension, transmission, etc. The tolerances were close (they usually were in German engineering) but all was well. But then decisions were made partway through the process to add more armor and other features. This added weight, and because of the rushed design / manufacturing / deployment process, new rounds of testing did not identify these mechanical issues cause by the changes. So the Panther “D” went out with many mechanical problems, from the engine to the dangerous exhaust system. The later Panther “A” corrected most of these problems, while the Panther “G” is just one of the most perfect tanks to come out of World War II. But this would come long after Kursk. “The prototypes and first 250 Ausf.Ds delivered were fitted with a V12 Maybach HL 210 P30, giving 650 hp (484.9 kW) at 3500 rpm. By May, it was replaced by the more powerful 23.1 litre Maybach HL 230 P30 V-12, 690 hp (514.74 kW), which made the late Ausf.D the fastest of the entire series and prompted an armour upgrade on the Ausf.A. The light alloy block was replaced by a cast iron one and two multistage “cyclone” air filters added, but the engine output was reduced by the low-quality gasoline. The average operational range was around 97-130 km (60-80 miles), reduced to 60-80 km (40-50 miles) cross-country. The Maybach P30 was compact, with a seven-disc crankshaft, and the two series of cylinders were not offset. However, this tight connecting rod space caused teething problems, like blown head gaskets, and the bearings failed early on. Not much to add to that good and concise reply! Nice one guys the up armour was the start of the mechanical problem I think the up guned the panther around then as well ? Pretty sure the gun for the Panther was always the KwK 42 7.5 cm L/70 … unless you mean the 8.8cm L/71 they’d later mount in the Jagdpanther tank destroyer. Engine wise. The initial issues were mostly down to poorly designed exhausts and a lack of fire suppression. As time went on, the Maybach engine was just engineered beyond its highest designed tolerance. Meaning the metal separating the engine’s cylinders were made thinner and thinner, to allow for bigger pistons to give the engine a higher output. You see this in great detail when looking at Bovington’s pictures of the Tiger restoration when they examined an engine from a Jagdtiger. No joke, there is a wall between the cylinders of about 3mm. That’s down from a thickness of about 8mm. This leads to poor heat transfer, less room for oil to effectively lubricate the parts and eventually, metal fatigue and failure of the engine block. No doubt the initial weight increase on Panther was the start. But it was an improvement built upon an already stressed and wobbly foundation. Possibly john I can’t remember the book I’m think of about the panther as said she was started as a German upgraded version of the T34 but Adolf got in the mix with change after change? that’s what happened Adolf’s spanner. Awesome info on the transmission and engines for the Panther, @johnlyons . The exhaust is certainly a big change, you can see it in the PSC 15mm kits where the difference between the options for D, A and G variants is mostly in the exhaust pipes off the back of the tank. Now the “F” variant of the Panther indeed had a different gun, KwK 42/1, but never went into mass production. Indeed, @zorg, one of the early prototypes for the Panther (VK3002 DB) looks almost exactly like the T-34 except with some interleaved wheels for the suspension. The reason the Daimler-Benz prototype was rejected had nothing to do with Hitler or the myth that it was because it looked too much like a T34. The reason was simply that its turret ring was too small to install anything larger than the 75mm L48. I have heard that myth as well . The source I saw it in suggested it almost as a sideways joke, I don’t think they meant it as a serious suggestion. But perhaps some people or other sources didn’t interpret the context correctly and took it more seriously. Hellfire and Chaos…who can turn down an offer like that! Another great offering from your talented though twisted mind. Did you get ALL the T34’s or did you leave some for other players to use? Lol mine all mine Shout’s @oriskany steamrolling another player of the table. Once again, I’m playing catch-up. Great series @oriskany . You’ll always get my attention with Panzerblitz and FoW models… even if I’m late to the party. As you know, I’m a big fan of massive Panzerblitz scrums! Thanks very much @cpauls1 ! Yes, I know you’re a big fan of PanzerBlitz, next week we have the FULL set up for Prokhorovka. 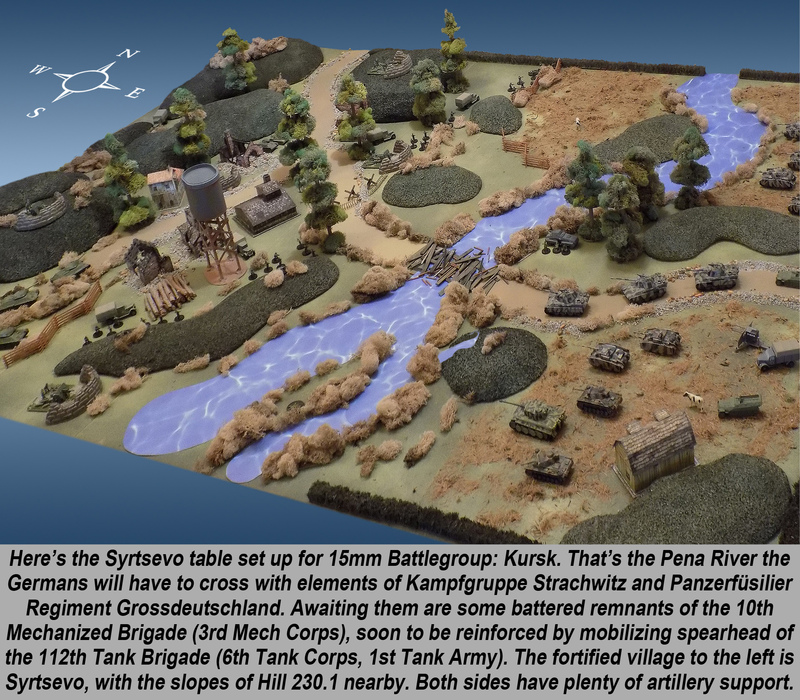 – something like 120 x 80 hexes, 1350 counters … on a physical board this PanzerBlitz map would be something like 7.5 feet long! I first read about and wargamed it over B17 40 years ago and have revisited many times. Each visit has offered better insight into the greatest of battles. Barbarossa and Bagration are the only 2 operations that are bigger. Operational or Grand Tactics level of warfare bleeds into both the Strategic and Tactical levels of warfare and the battle of Kursk most definitely does so. In fact it comes close to being strategic as Barbarossa and Bagration. This fact plays well into the Russian hands as at the Strategic level they are at their best while the Germans are at their worst. However at the Tactical level the Germans are at their best while the Russians are simply flat footed, so at this level Kursk plays into the Germans hands. However the Russians by now know well the ways of the “Summer Tourists”, as they called the Germans. The defence lines built by the Russians were elastic lines of defence in depth by several such lines. Each line was built by mutual supporting clusters of defence. The combination of these defences has a WW1 look and feel to it. Yet this defence was modern designed to capture and hold an operational blitzkrieg attack and in doing so removed the tactical dexterity of the Germans. It the Germans were less interested in launching this offensive and paid more attention to the photo reconnaissance, they should have realised Kursk was now far too fortified to be winnable and would be a shameful waste of men and material. The best way I think to explore this facet of Kursk is to play the whole battle in a hex and counter game with brigade or division as the smallest units SPI years ago released such a game and it was one of my favorites. It included the massive Russian armY held in reserve on the map for the Russian counter offensive. It was a truly awesome sight to see all those counters on the map. It sounds like a good idea to pump out all your latest and greatest hardware and rush them to the front to hammer the enemy, but is it? Take the Panther d. The lower case d means it is the fourth generation preproduction prototype and probably not ready for combat trails but was ordered into production. Once the bugs were sorted it finally went into production as the Panther A.
Ferdinand is a project name as German AFVs are named generally after creatures or insects and once to bow MG is added it is christened the Elephant. The Grisly Bear is a urban assault vehicle that was designed to take out strong points in buildings at Stalingrad but it was not developed in time for the battle. This looks more like scraping the bottom of the barrel rather than producing your best. The main issue here after questionable reliability is the matter of doctrine, there is none. This means that their crews have no idea of how they should be used and commanders have no idea what they are for. As an example in the US army when the M10s were issued to infantry generals they tended to dig them in as static artillery. The Panther was perhaps the easiest. It had a powerful gun and had about half the armour on its side as it did the front. The basic German concept of a tank, so it is a Pz-4 replacement. This is straight forward enough for a field commander to put it to effective use. The Ferdinand on the other hand is confusing at best. On the label it says it is a tank hunter, but it is so slow for the job. It has a great gun with range. It is armored up like a crawling pill box so should it be used as an assault gun to crack open the enemy line or hold it way back using the long killing range? With the Grizzly what is an urban assault vehicle doing in a rural setting, do I threaten barns with it? So the crews may believe their vehicles should be used one way while the field commanders may believe it is another. Doctrine matters. The way I would use the Ferdinand would borrow from Tiger doctrine of the day. Each Ferdinand would have an escorting tank either a Pz-3 or Pz-4 armed with a short 75mm. You can still separate infantry from tanks using artillery barrages and the Russians have more than enough artillery in this battle to do the job. Given the depth of layered defence at Kursk I would use a series of linked games rather than a single game to capture the feel of this battle. For each of the five defence zones I would use a line of five boxes with the game starting in the middle box. If the attacker wins the next battle would be fought in the fourth box or if the defender wins then it will be fought it the second box. Draws mean the next battle would be fought in the current box. Battles would be fought until someone runs out of boxes. Using a system like this means that the armies don’t have to be large for each battle but you get the epic battle feel. If you have a time issue then drop to using 3 boxes. I think it would be great for platoon size games such as Bolt Action to capture the Kursk size feel in this way. If you want you could give points out at the end of each game to rebuild you battered units or buy new ones. You could give a basic points value at the end of each game plus bonuses for victory points and objectives held. Id be inteested in any evidence of a lower case ‘d’ designation on a Panther. Starting in 1942 the first 20 prototype vehicles were produced under the nomenclature Ausf A1. This was later changed to D1. The Brummbar (a name attached to the vehicle post war… the vehicle was the Sturmpanzer IV or ‘Stupa’ as the troops called it) was designed to reduce enemy bunkers and fortifications. It performed well in this role at Kursk, especially targetting AT fortifications, and indeed had such an effect that it became a priority target to Soviet gunners. Okay, time for a proper reply to these … Apologies for the delay, again it’s been, well … let’s just say a day that we couldn’t spend much time on hobby. @jamesevans140 – Very glad to see you back! As for differences between the Soviets and Germans at tactical, operational, and strategic levels, I think we have different definitions of “strategic,” but I totally get what you’re saying and agree. 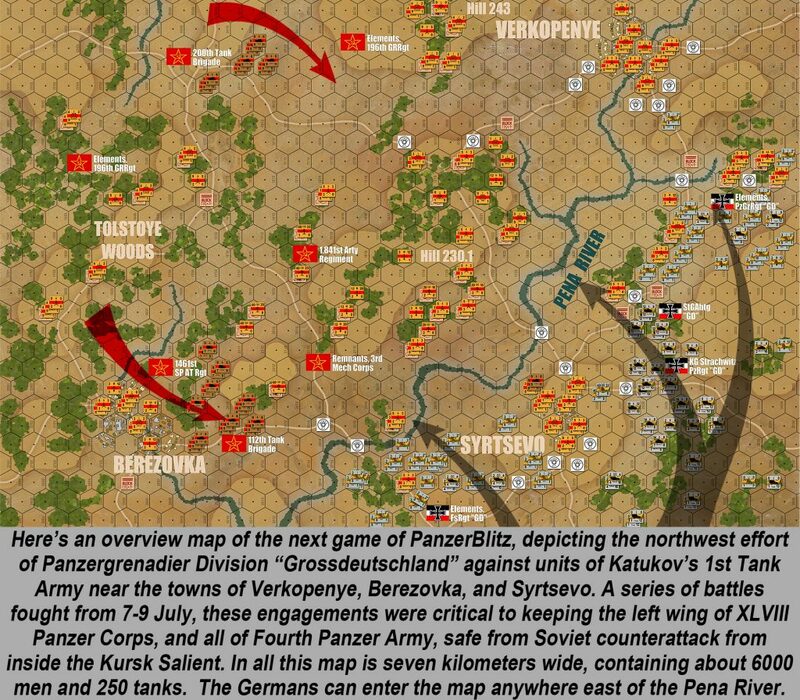 The best way I think to explore this facet of Kursk is to play the whole battle in a hex and counter game with brigade or division as the smallest units SPI years ago released such a game and it was one of my favorites. GMT also has several great titles in this category, two of which were featured (briefly) in Part 01 of this series. 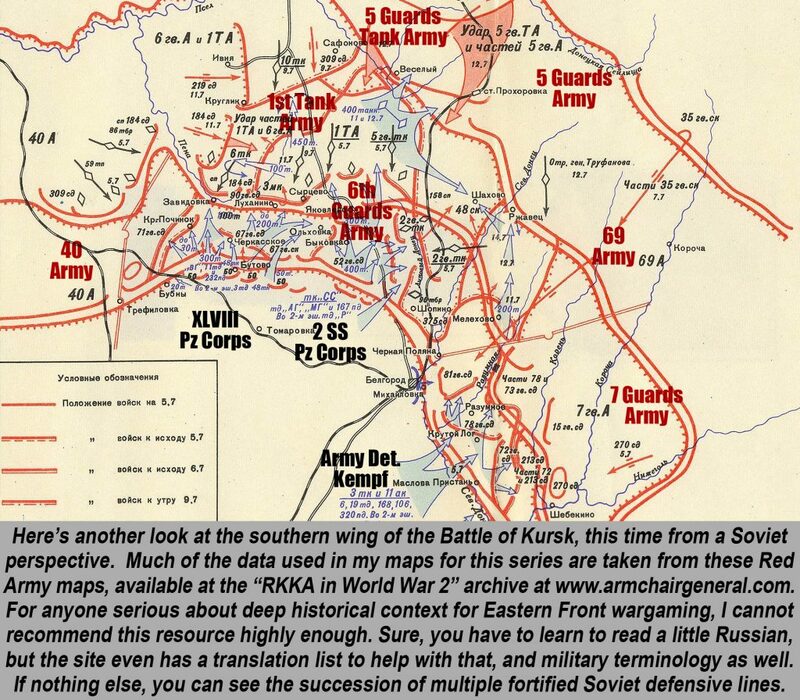 It included the massive Russian army held in reserve on the map for the Russian counter offensive. That’s my man Konev. We see him in action with Operations Kutusov and Rumyantsev in Part 05. I’ve always wondered by the designations of these variants are not in alphabetical order for the Panther. I’ve always seen it as “D,” however, as do all my sources (865 produced up through Sept 43 – chassis numbers 21001-210254 and 211001-21400). I would agree that the flank armor on the Panther (whatever the variant) is a little disappointing, at least in most tactical systems I’ve played or reviewed. I’m not sure the Ferdinand was too slow to use as a tank destroyer, as least as the Germans saw the doctrine. As the Americans saw it, certainly, but it seems clear the two armies had different ideas on the TD concept. Where I would agree is that the Germans should have found a way to use the Ferdinand, as you say, to “to hold it way back using the long killing range” … i.e., as a defensive weapon. To deploy these as spearhead assault units seems odd. I was able to get great success with them in Part 03 in both PanzerBlitz and Battlegroup by keeping them closely coordinated with supporting infantry, but (a) I was lucky and (b) my boards / tables might have been just a little too dense terrain-wise (more cover = better opportunities for support infantry to stay close to the vehicles without being slaughtered by Soviet MGs, off-board howitzers, and on-board infantry howitzers. Each Ferdinand would have an escorting tank either a Pz-3 or Pz-4 armed with a short 75mm. That’s actually a really good idea. 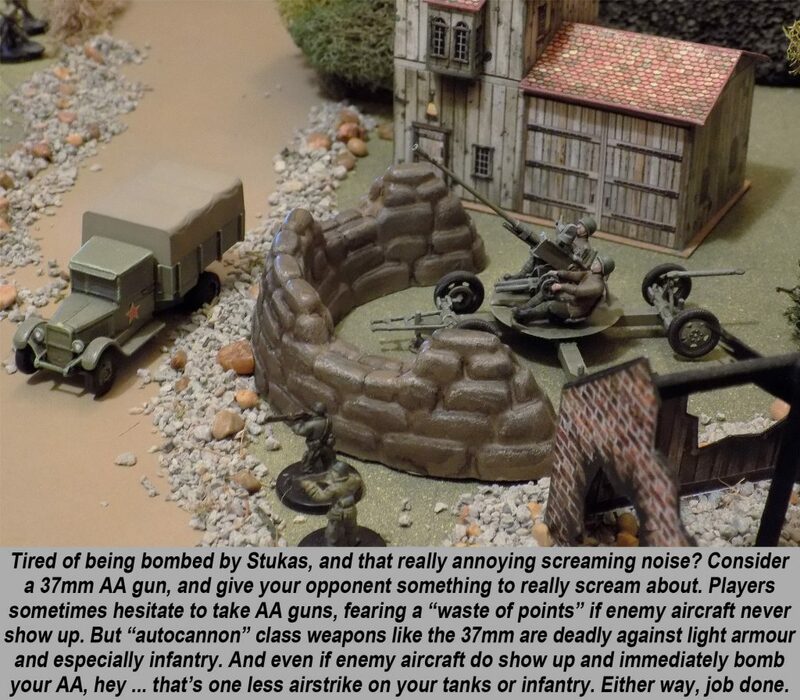 Anything to keep Soviet infantry off of them, or suppress soft targets like Soviet 76.2mm or the new 85mm ATGs. Man, I “luves me a Sturmpanzer IV” – performed so much better than the Ferdinand at Kursk (as you say), and on the table it’s just such a great application of heavily-armoured HE firepower. Just a shame that it’s so rare historically and so there aren’t many opportunities to use it in historical-accurate scenarios. Needless to say, I wanted to feature StPzAbtg 216 in Part 03 of this series. As rare as they are, I really wanted to take the opportunity as it came. Thanks @piers. After the move most of my library is still in boxes but I will try and find the book for you that described the significance of upper case and lower case model numbers. Was not aware of the post war naming of the Brummbar, however the nomenclature remains unchanged. The training of the crews would have them going for a hard point just like in a city, but how should it integrate in a combined arms attack in the open fields. Are higher level field commanders aware of its weaknesses to be able to apply the correct resources to protect it. Without training together it will fulfill its main attack function it was designed for but the rest will be a bit on the clumsy side until a doctrine is established, such as countering the priority fire it is going to get. What units best counter this and what are the best tactics to achieve it. Hell of a way to come up with all this after first contact. That’s not to say that established doctrine can’t be wrong as it can be at times extremely wrong and discovering it only after the enemy gives you a good kicking. The main point I was trying to get across is that they were dumping every thing from the fridge into a pot and were going it would taste good. Today in the corporate systems environment we would not implement this many unknowns as they would cause something to fall over in one way or another. By the way I went to WinterCon on the weekend. At the top of my list was both your Africa books. However no supplier had them as Australia is out of stock on about half your books. Our group will have a focus on the North Africa campaign until the end of the yea. We will use BG to zoom in at 25mm, FoW4 full rules, 1/200 scale for large actions, an operational and a strategic level boardgames. Painting 8th Army troops as we speak. Sounds great, @jamesevans140 – you should start a Project in the new “Project” area for those North Africa units you’re painting up. I’ve been putting together a lot of the old “Darkstar” sci-stuff we used to discuss waaaaaay back on some of the naval thread, happy to say it’s getting a lot of support!